Making a silk screen from your favorite piece of your child's art is easier than you think! We've been making them for years, and chances are when you see Pete out and about he's likely wearing one of the six or so the kids have made for him for various birthdays and holidays through the years. 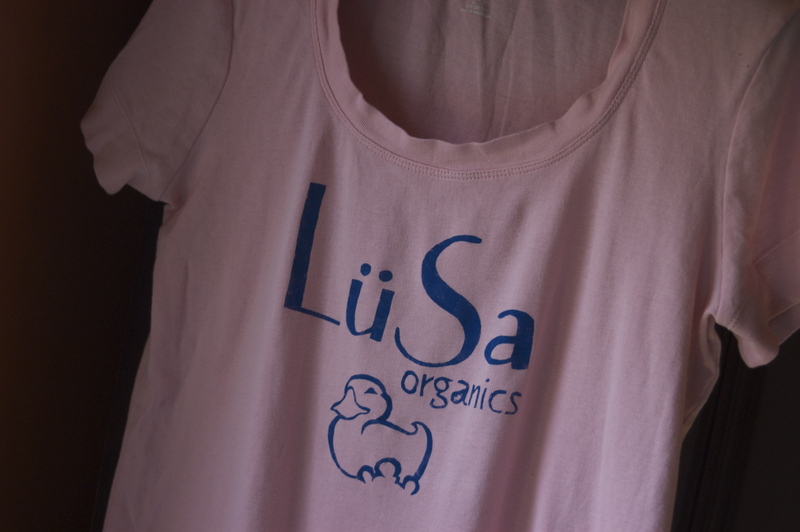 I wrote a tutorial on how to make your own, demonstrating with a shirt that I made for myself back when I sold at the farmer's market. Grab a blank t-shirt, your exact-o knife, and some paint and let's get to work! Freezer paper stenciling is a simple way to create an imprint of any simple illustration or text. And it is easier than you many think. You probably have most of what you need on hand already. So go and gather your supplies, and let's get started. The only time consuming part is cutting your stencil (you can reuse them up to three times). If keep your design simple and you can quickly make several shirts or tote bags in an evening. A Note on Supplies: Most supplies (with the exception of fabric paint) can be found at your local hardware or grocery store. Freezer paper is not the same thing as waxed paper. Freezer paper is a thick white paper used for wrapping meat. It is plain paper on one side and has a thin plastic coating on the other. The plastic coating is the magic part that will adhere to fabric and peel off with ease. As for your shirts, check your own closet before you go shopping. A button down shirt, a tee-shirt, a tote bag or a denim jacket are all great options for this project. You can even screen over some prints. Clothing with a small stain is a great candidate for this project – just place your silk screen to hide the spot! In the example above I began with a computer print out of my company name and part of my logo. For the shirt we made for Pete from Lupine's drawing I took her art and photocopied it, then enlarged it to size. Choose a simple image because you'll be cutting out anything that you want to print and tinly lines can be cumbersome. Tear off a suitably sized piece of freezer paper. Place the freezer paper coated side down over your illustration. Using a pencil, carefully trace the outlines that will become the inked areas on your shirt. With your craft knife cut carefully along your pencil lines. Be sure to use a sharp blade and cut on top of a cutting mat or board. If your blade begins to resist the paper replace it with a new one to avoid tearing your stencil. Set aside any small pieces that you'll need to use during the project. (For example, the inside of a letter "O" or a central piece of your illustration.) I set aside parts of three letters, the duck's body, and the duck's beak. After your freezer paper stencil has been cut out, trim away some of the excess around your design. This will allow for easier placement on your shirt. Attach to fabric using an iron set to cotton blend (no steam). Center carefully and iron in appropriate location on your shirt with the coated (plastic) side down. Do not slide the iron around or you may tear your stencil. Instead gently place and press with the iron until all areas are well adhered. Carefully place the smaller floating objects and iron into place using the point of your iron. You may want tweezers to place accurately. Insert a piece of cardboard or a thick pad of newspaper into your shirt. Paint your stencil using fabric paints or a blend of textile medium and acrylic paint. I prefer the textile medium and acrylic paint menthod because I can custom blend paint to match my project. Blend more paint than you think you will need. Using a small, stiff-bristled brush paint your shirt using a stamping motion with the bristles (rather than a swiping motion which can cause paint to sneak under the edges of your stencil). Continue to stamp paint throughout all exposed areas on your stencil. Touch up areas where the paint looks too thick or too thin and strive for even coverage. The fabric should have a solid coating of paint but not a visibly thick layer. A second coat is a great idea if you want a professional looking shirt. Allow your shirt to dry completely and then remove stencil. If you are in a hurry you can speed up the drying process with a hair dryer. Iron for 30 seconds to set ink, and wear. It's that easy! This project is ideal for shirts and bags or wall hangings of sweet kid art. But they sky is the limit. What can you imagine? This counts as homeschooling, yes?